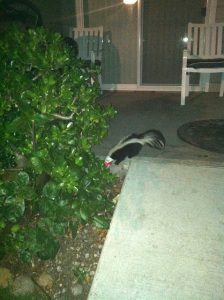 Skunks are particularly prone to getting their heads stuck in Yoplait containers. Photo by Marilyn/Flickr. It’s horrifying to see a skunk running across a road with a container stuck over his entire head. He darts into traffic, nearly causing an accident. You want to help, but you’re afraid of getting sprayed. What to do? First, understand the source of the problem. Skunks have a keen sense of smell, and plunge their heads into discarded food containers. Unfortunately, yogurt containers (especially the Yoplait brand) are perfectly sized to entrap a skunk’s torpedo-shaped head. The inward-folded lip design of the Yoplait container ensnares the skunk’s head, and the skunk’s limited dexterity prevents him from pulling free. 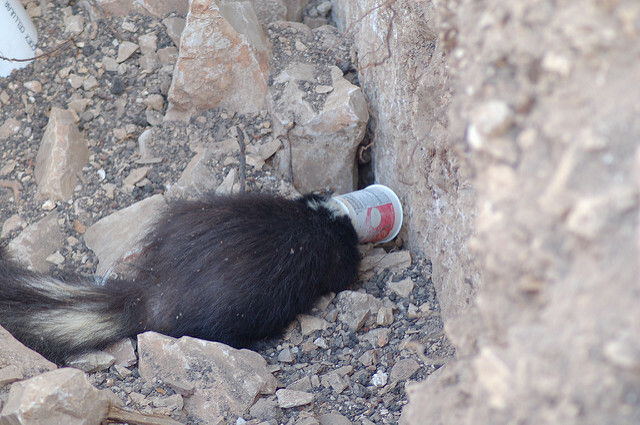 Skunks and other wild animals like squirrels are also known for getting their heads stuck in other types of discarded food containers, such as peanut butter jars and plastic drink cups with dome-shaped lids. If not helped, these animals will die of starvation, dehydration, or predation. You can get the skunk free in a matter of minutes. First, know that skunks only spray things they can see. When his head is caught in a container, he can’t see —so you aren’t in any danger of getting spritzed. Prevent possible entrapment by washing and crushing yogurt containers. Photo by Ticatati666/Flickr. Approach the entrapped skunk and, with a gloved hand, take hold of the opposite end of the cup or container. The skunk will pull back, feeling the resistance. Usually this is enough to get him free, though you may need to pull a little. Once his head pops out of the container, he’ll stare at you and blink. Stand perfectly still (skunks are very nearsighted and can’t see things that don’t move) and he won’t spray. After a few seconds he’ll get his bearings and run off. If the container is wedged tightly on, you may need to use curved nail scissors to cut him free. Stand over the skunk, and hold the container firmly. Cut a little slit or two where the container meets the skunk’s neck, but be sure that the scissors are curved away from the skunk’s neck, so you don’t cut him by mistake. Just making 1 or 2 half-inch slits is enough to loosen the container. Move in front of the skunk, then gently pull it off. Once the skunk’s head is free, stand perfectly still until he runs off. If you are too nervous to do anything hands-on, put a milk crate or upside-down laundry basket (with a weight on top) over the skunk to hold him in place until you can get help, and to prevent him from running out into traffic. Remember, if a skunk’s head is in a container, he can’t see – and therefore won’t spray. 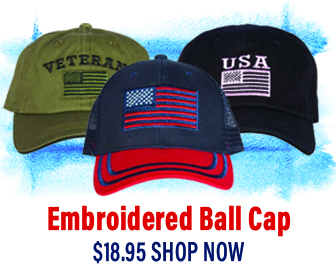 So you don’t need to worry about getting sprayed while putting something over him to prevent him from running off. Reach out to a local wildlife rehabilitator and ask for help. Wild animals are naturally inquisitive. So it doesn’t matter what type, whether it’s a Yoplait yogurt cup or another type of food or beverage container, litter presents a serious hazard for wildlife. Always wash food containers thoroughly, crush all plastics that could possibly entrap a skunk or other wildlife, and dispose of waste properly. It might not seem like a big deal, but for animals most at risk of becoming entrapped, their lives depend on it.